When does chaos recede in the career of a criminal? It is only later - when the criminal is incarcerated - that the truth can be revealed. In the case of Charles Manson, only Edward George was there to witness this emergence. Here he offers us an inimitable glimpse into the mind of a madman. As Manson's prison counselor, George took on many roles: agent of discipline, erstwhile press agent, father confessor, and, almost, friend. George had access to a Manson the public didn't, witnessing the method to his madness, the charisma underlying his sickness, the pathetic boy within the homicidal man. 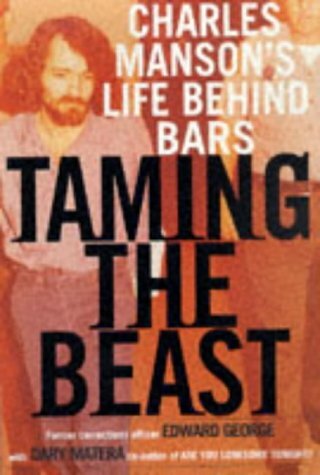 "A valuable book which gives additional insights into the criminal mind of Charles Manson." --Vincent Bugliosi, author of" Helter Skelter" "[George] strives to understand Manson and his devotees and, spewing psychological and spiritual insights and plenty of witchy Masonoid details, succeeds in horrifying his readers.' --"Booklist" "["Taming the Beast"] puts a human face on a man whose very name defines evil-revealing the personality hidden during television interviews." --"Almeda Journal" "The latest entry in the canon of a true madman...this volume...gives us an ugly, ugly look at a man whose entire life has been a study in sickness." --"Kirkus Reviews" "This anecdotal account...confirms that Manson remains without remorse, unstable, frightening, and unlikely to ever be paroled." --"Library Journal" "Manson continues his reign as America's leading celebrity carnivore." --"Phoenix Arizona Republic"